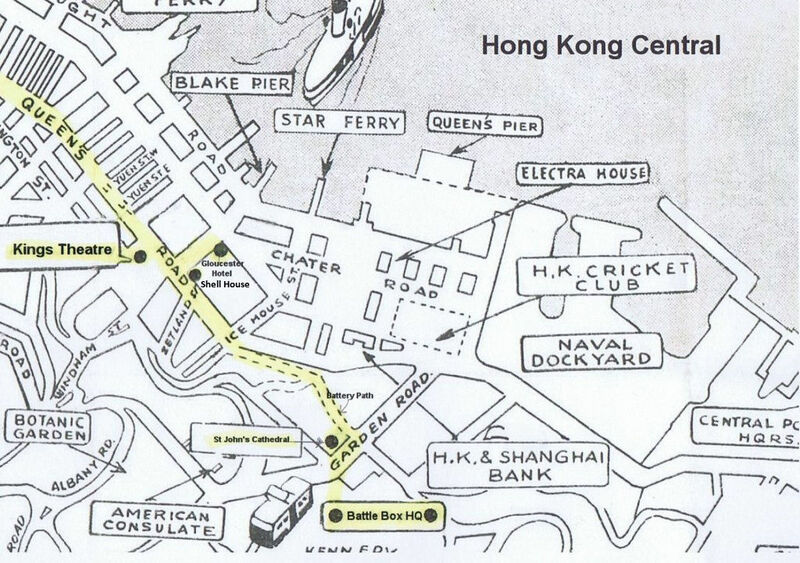 The Battle Box Staffies made their way down Battery Path and along Queens Road to Shell House where Admiral Chan Chak had his Head Office on the 2nd floor. The Chan Chak party left town in two cars with Henry Hsu leading, Ted Ross had his Buick parked outside the King's Theatre. Major Goring stayed in the HQ for a further hour assisting with the surrender procedures. Maj Goring BHQ: "When I emerged from Battle Headquarters there was a good deal of bombing and shelling going on and the Cathedral (St John’s) was in trouble. When I reached Ice House Street, round the corner came an Austin seven saloon, driven by a private of the Royal Scots.